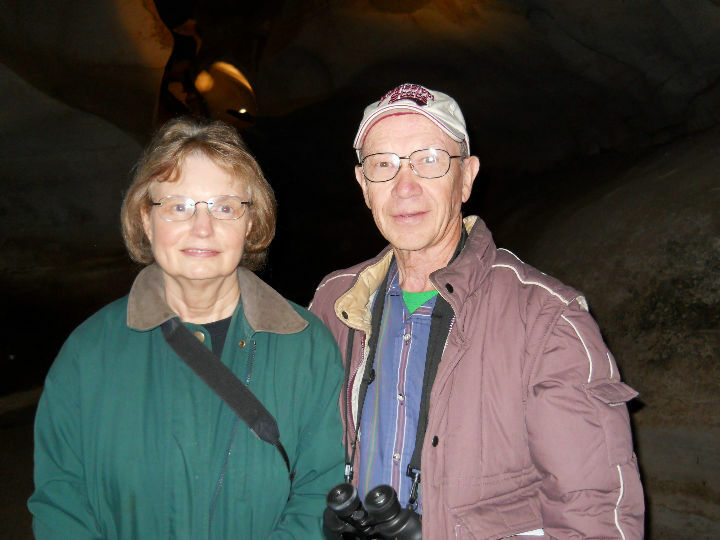 This trip covered December 28, 2012, through January 7, 2013. 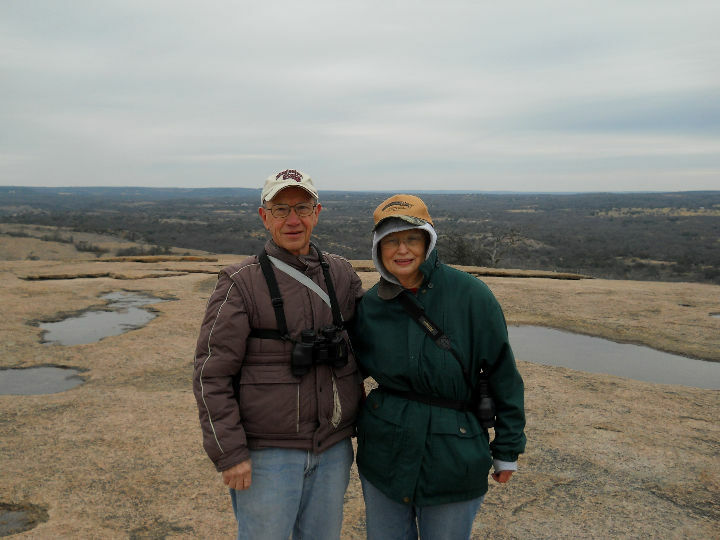 We went into the Texas Hill Country around Belton and Llano. 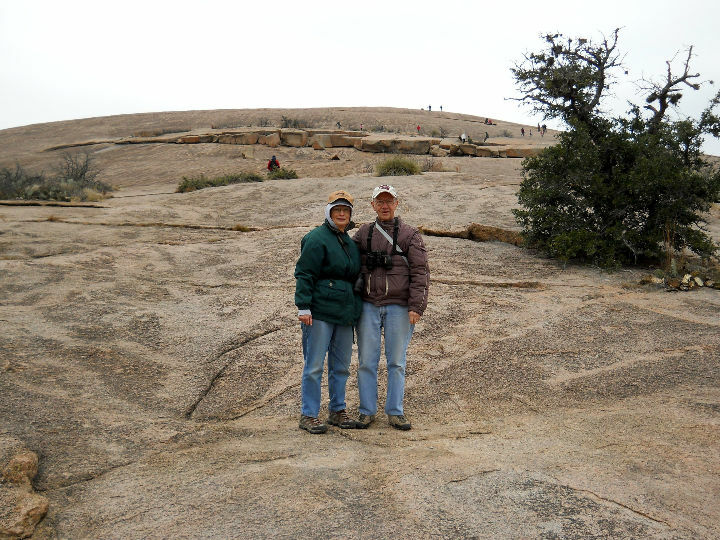 The weather was a little colder than we had hoped for, but we were able to accomplish our goals for the trip, one of which was going to the top of Enchanted Rock. We hope you enjoy our story and photos. [Friday] We had a difficult time getting out of Richmond today. 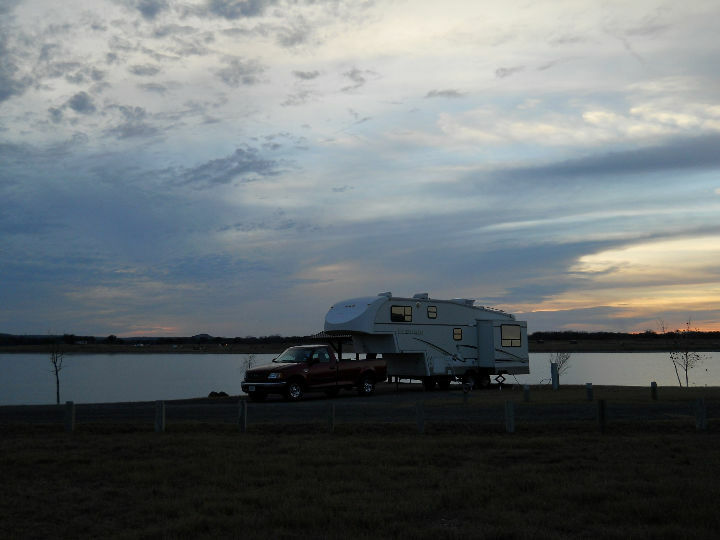 The trailer needed some service to the kitchen plumbing that Lawson discovered too late on Thursday to get resolved, so he made an early run to Bluebonnet RV in Rosenberg this morning. Kay had to visit Comfy Home while Lawson did the trailer thing. We finally left Richmond around 11:30 AM. We went up TX-99 to IH-10 to Sealy. At Sealy, we discovered the truck had the "service engine soon" light on and the idle was too low. A stop at the Ford dealership confirmed it to likely be a vacuum system problem. They were too busy to work us in so we decided to continue on up TX-36 to our first night stop at Dana Peak Park on Stillhouse Hollow Lake, near Belton, TX. We arrived about 5:15, just before dark, with a strong cold wind blowing unhindered through the campground. This is a very nice park right on the lake, with plenty of space between sites. It got down to 32 degrees that night. < Our campsite at Dana Peak Park. 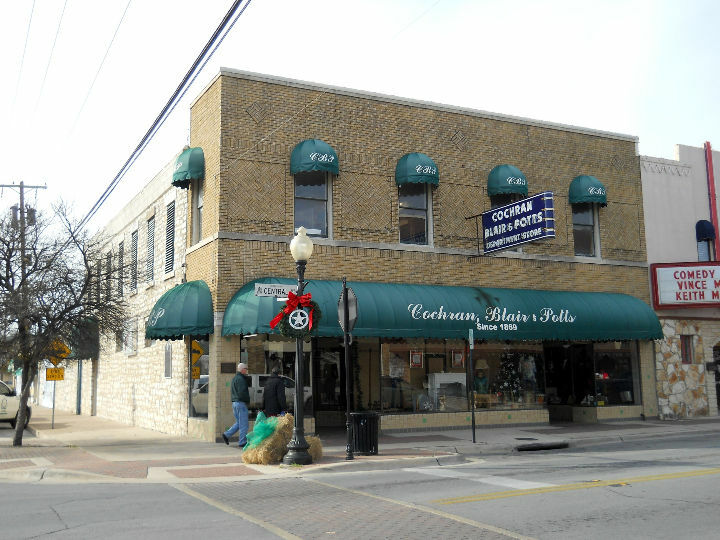 [Saturday] In the morning, we drove to downtown Belton to visit the Cochran, Blair & Potts Department Store Museum. 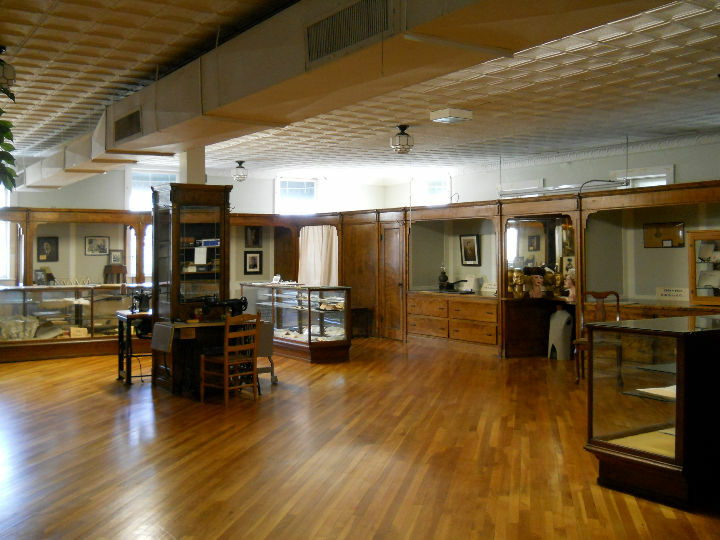 The museum is located on the second floor of the Cochran, Blair & Potts Department Store. It is the oldest department store in Texas, opening in the 1860s and remaining in continuous operation until today. The museum gave an interesting history lesson on the four generations of ownership of the store. Afterwards, we went to Kay's cousin's home to visit with James & Willa Dean. We enjoyed lunch in Oscar and the Oscar Store - very interesting place. Thanks to James, we found a place to repair the truck on a Saturday, while we ate lunch. Such a deal! The problem was a defective idle control valve. 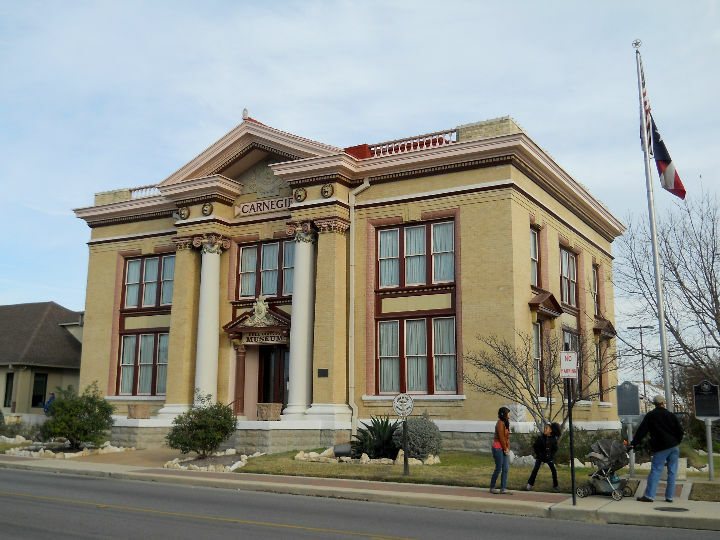 After that enjoyable visit, we drove back to Belton and toured the Bell County Museum, housed in a restored beaux-arts-style Carnegie building constructed as a library in 1904. It covered the history of Bell County and was also hosting an Abraham Lincoln traveling exhibit. < < Cochran, Blair & Potts Department Store Museum. < Bell County Museum. [Sunday] This morning we woke up to a 30-degree morning, with the water hose almost frozen. After breakfast we went to Belton and drove around the Mary Harden-Baylor University campus. The school appears to be in a large expansion, including a new football stadium. Founded in 1845 in Independence, TX as the female department of Baylor University, it was moved to its present location in 1886. 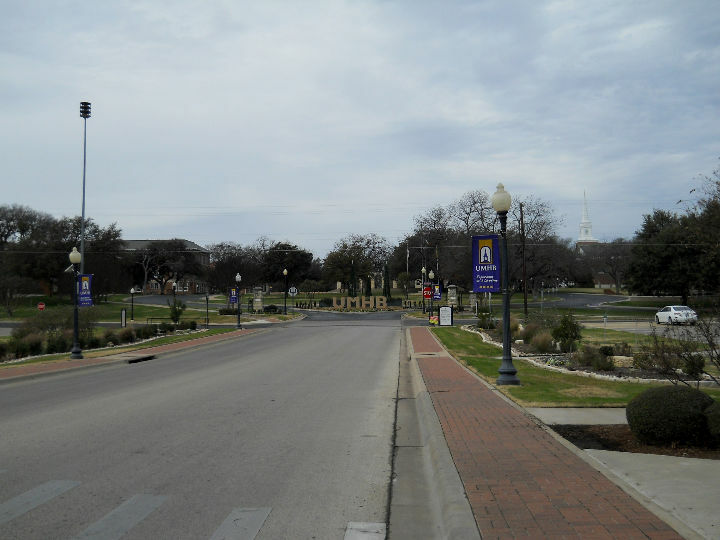 A Sunday during the holiday break made for zero traffic on campus. We drove around some of the adjacent historic homes afterwards. 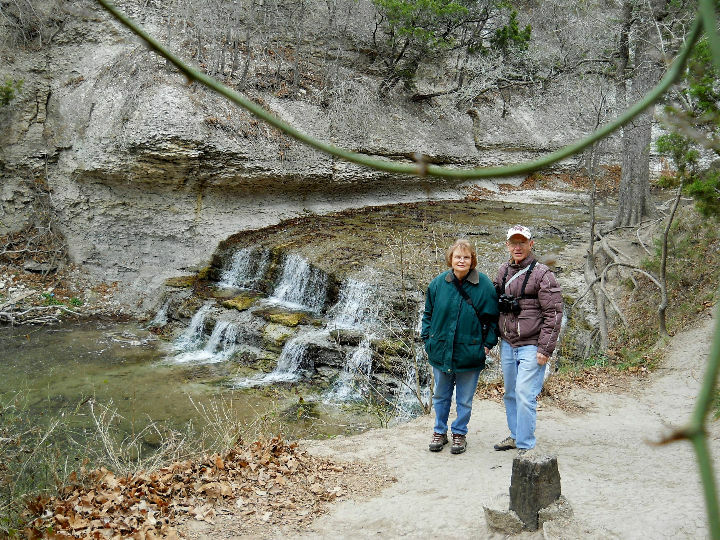 After our downtown explorations, we drove to Chalk Ridge Falls Park, below the Stillwell Hollow Lake dam. 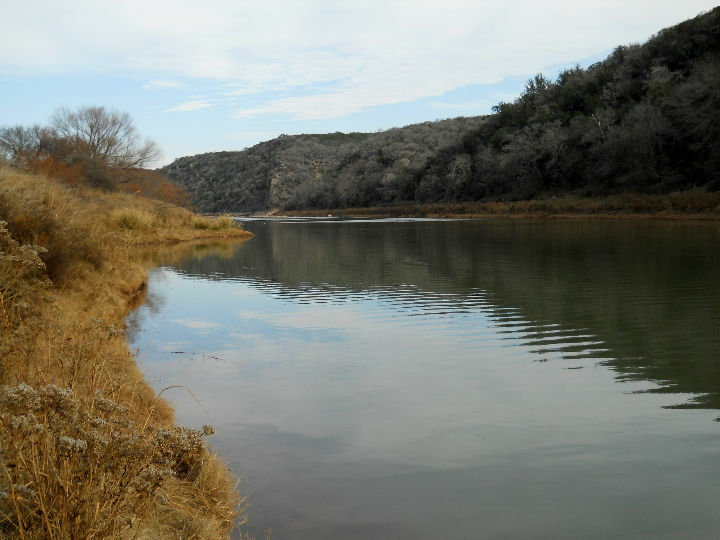 We hiked along the Nature Trail that parallels the Lampasas River for about 1 1/2 miles. After it began to drizzle rain, we turned around and walked back to the truck. 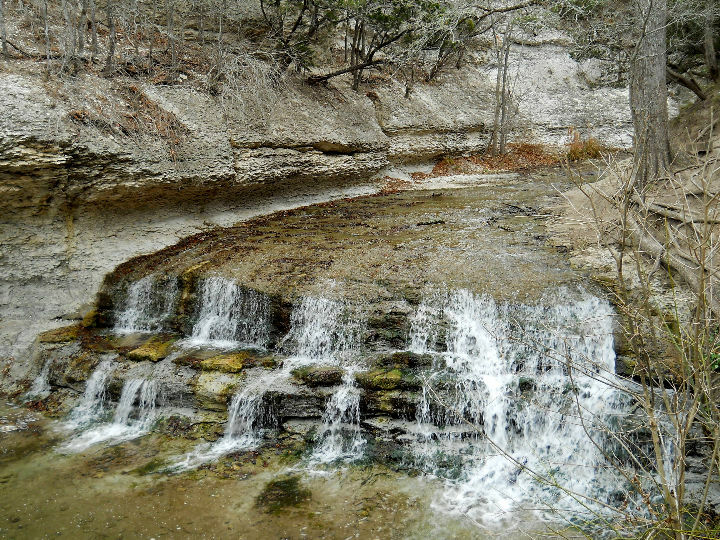 The falls is reasonably good for Texas, considering the multi-year drought. < Entrance street to MHBU. 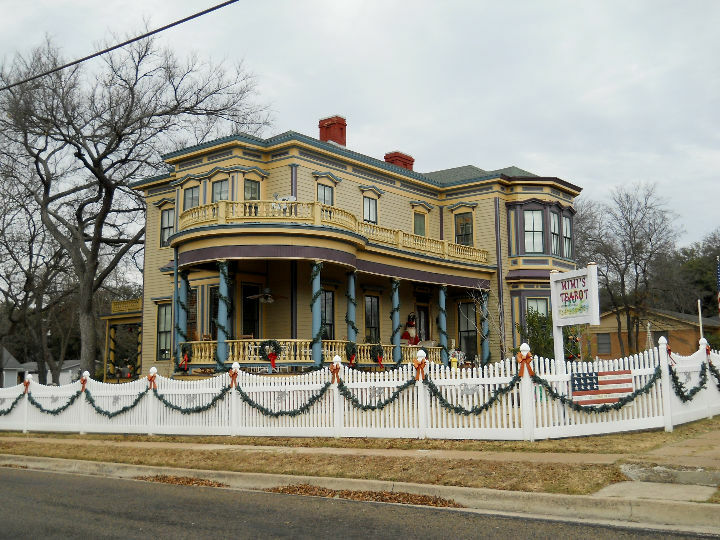 < Unusual old home in Belton. < < Chalk Ridge Falls. [Monday] We awoke to a temperature of 41 degrees and dense fog and mist. We left the park and traveled west on US-190 to Harker Heights for our traditional stops at McDonalds for wi-fi and Walmart for groceries. 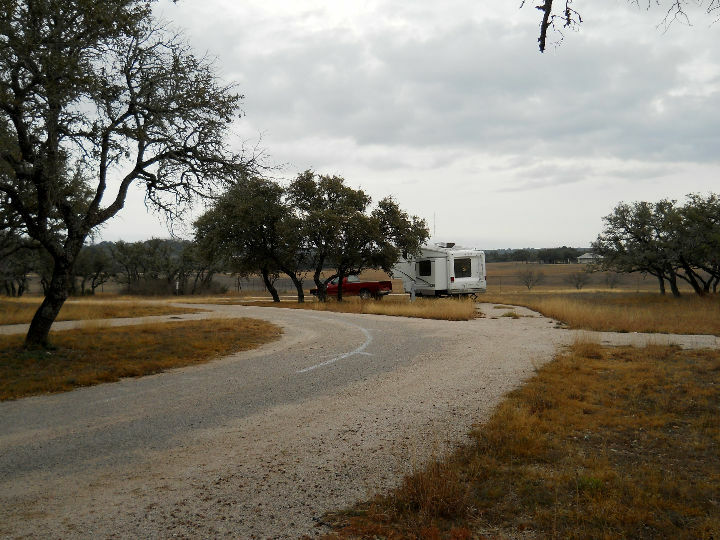 Then we continued on US-190 to Lometa Regional Park in Lometa, TX. The park is not bad as a place to sleep and eat, but is a pretty basic city type park. After a brief lifting of the fog and a high temperature of 61 degrees, the fog came back in and settled for the night. < Our site #3 at Lometa Regional Park. [Tuesday] This is New Year's Day, 2013. After breakfast we drove about 25 miles to Colorado Bend State Park to spend the day hiking and enjoying the scenery. It was a bit breezy and in the 40s when we arrived about 11:00 AM at the park. The park is at the end of a 9-mile gravel road and is the most rustic of the State Parks we have visited. 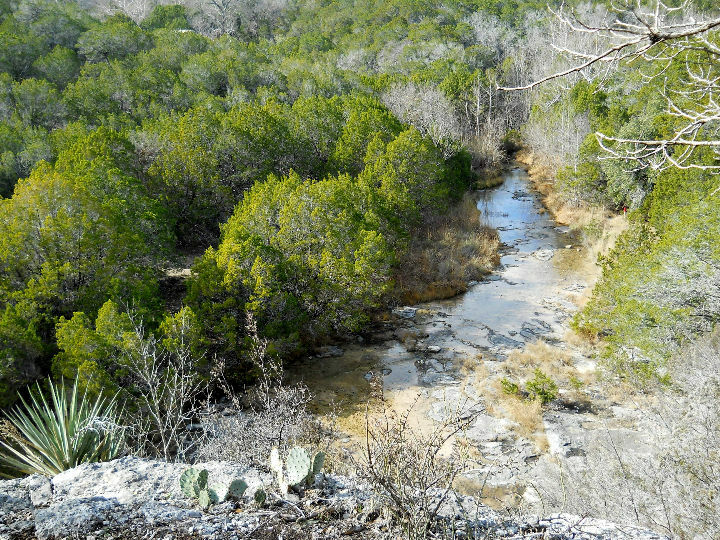 After checking in at the office, and eating the lunch we had brought with us, we decided to hike the Spicewood Canyon Trail, which runs 2 miles from the parking lot. It is mostly up and down hills, but the trail is good and not too steep, but lots of rocks. Along the way is a beautiful overlook of the creek below. It took us about 2 3/4 hours to hike it at our very leisurely pace. On the way back, across the Colorado River we saw a large Axis deer with a very large rack of horns. We stood and watched him for a long time, as he did the same to us. It was a very impressive site to see him in the wild. After another snack when we arrived at the truck we drove back to Lometa. 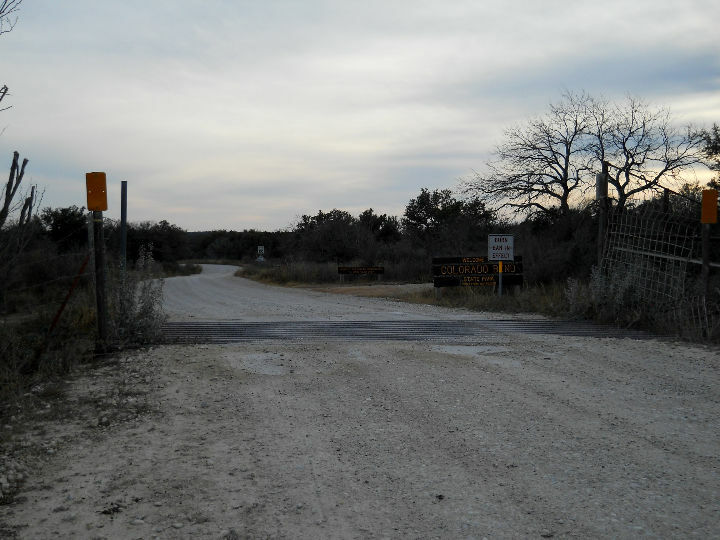 < Colorado Bend State Park entrance sign. < Colorado River from the park. 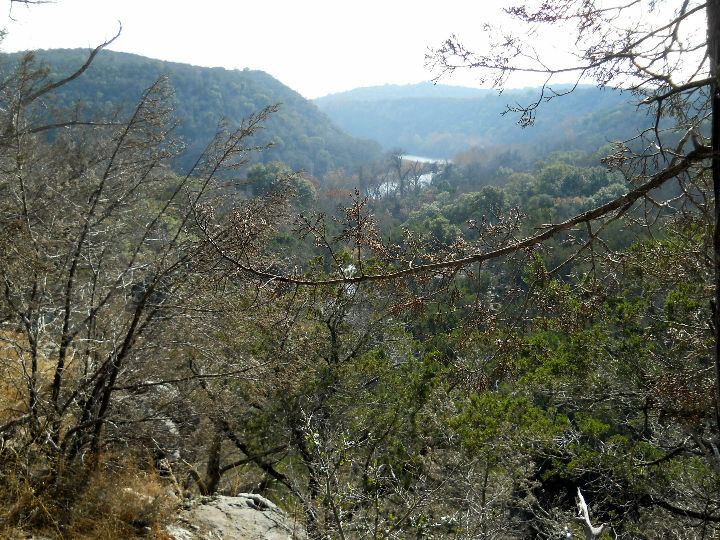 < < Views from the Spicewood Canyon Trail. 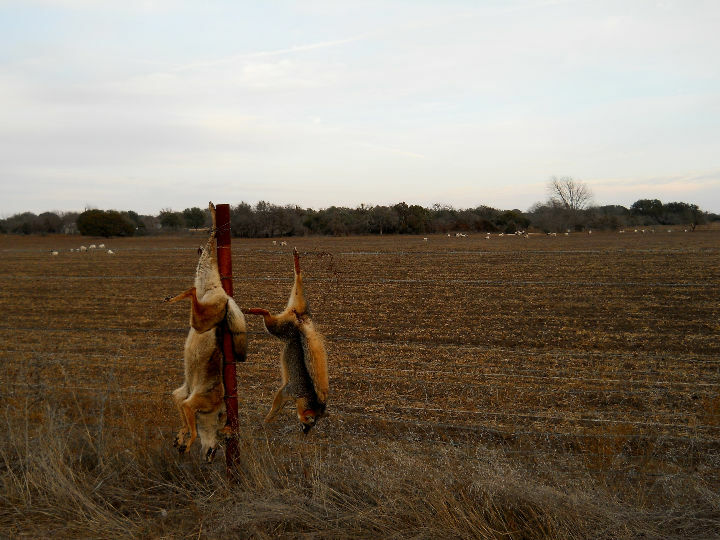 < Foxes and sheep don't mix on Texas ranches! [Wednesday] In the morning we awoke to 31 degrees and left Lometa and went south on FM-581 and FM-501 to Cherokee, then south on TX-16 to Llano. Before checking into the City of Llano RV Park, we made our mandatory stop at Cooper's BBQ, to have lunch and to stock up the freezer with BBQ. We also had the spare propane tank filled so that we won't have any unpleasant surprises on one of these cold nights. 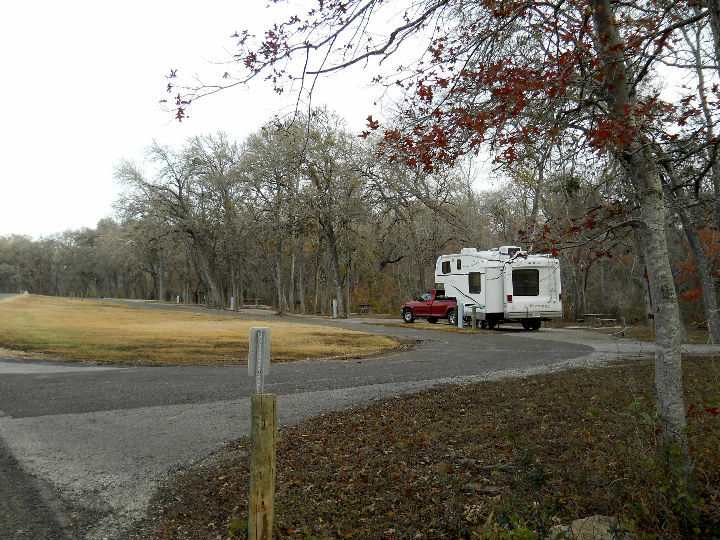 We relaxed in the trailer for the rest of the day and did bird watching from our trailer, seeing male Vermillion Flycatchers flying around the park, which is on the banks of the Llano River. Later we saw a group of American White Pelicans fly over the river. Finally we were awed by a Hill Country sunset. < Our campsite #10. 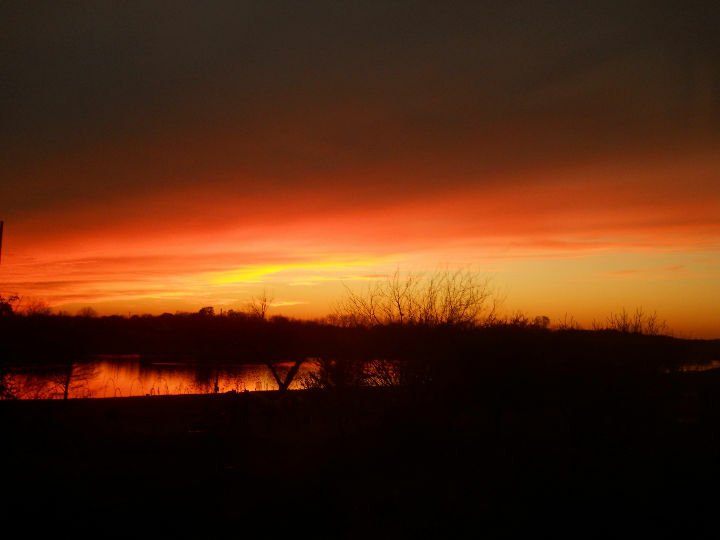 < Sunset in Llano. [Thursday] We awoke to the coldest morning of our trip so far, 27 degrees. We decided to stay around the trailer this morning until it warmed a little. 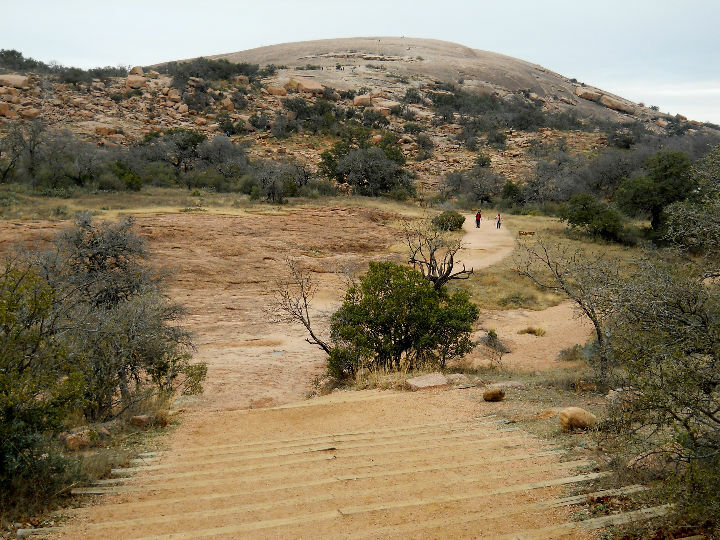 By the time we ate lunch, it had warmed into the upper 40s, so we drove about 25 miles south on TX-16 to Enchanted Rock State Park. It was threatening to snow a little when we started up the Summit Trail around 1:30 PM. It is 425 feet elevation from the start to the top of the rock. 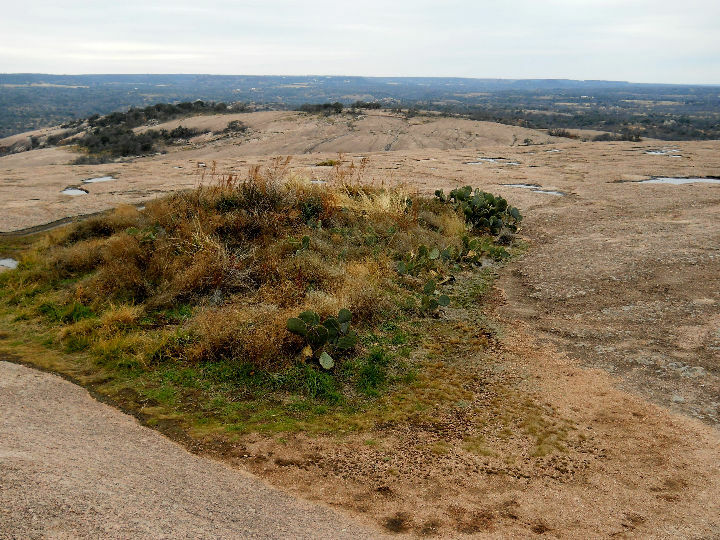 You have a great view of the Hill Country from the top. It took about 2 hours for our round-trip and the distance is 1.2 miles total. < View from the Summit Trailhead. < On the way up; its cold! < View from the top. < Here we are at the top! 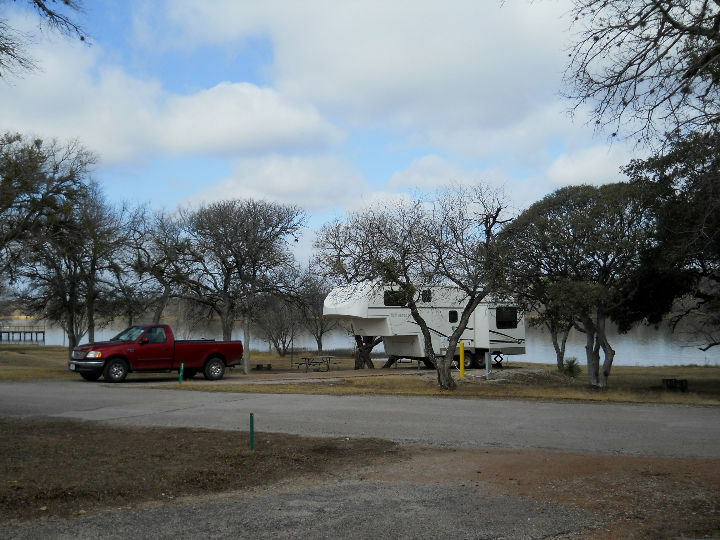 [Friday] In the morning, we left Llano and traveled east on TX-29 to Inks Lake State Park. We got into site #273, on the water. It was cloudy and cold - in the low 40s - so we decided to stay in the trailer and relax and read, along with some bird watching. We saw Chicadees, Titmice, ducks (including Mallard) and Ring-billed Gulls. < Our site #273. 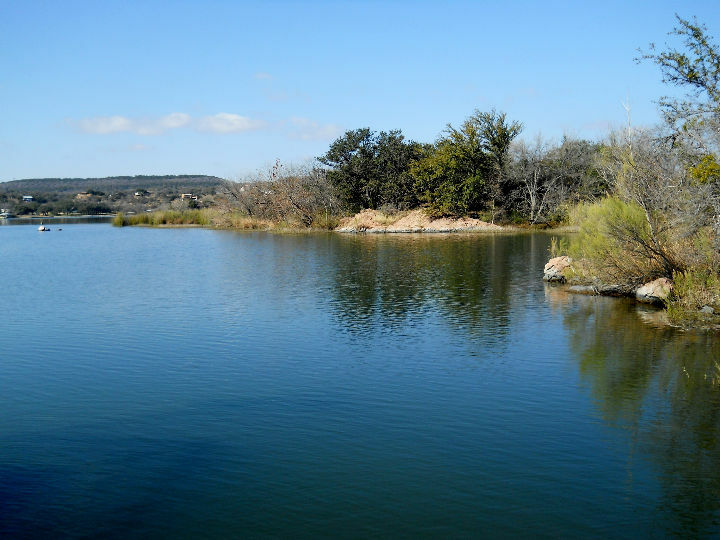 < View of Inks Lake. [Saturday] In the morning, we got a slow start and after breakfast we went to the park office to check if any interesting happenings were taking place in the park. 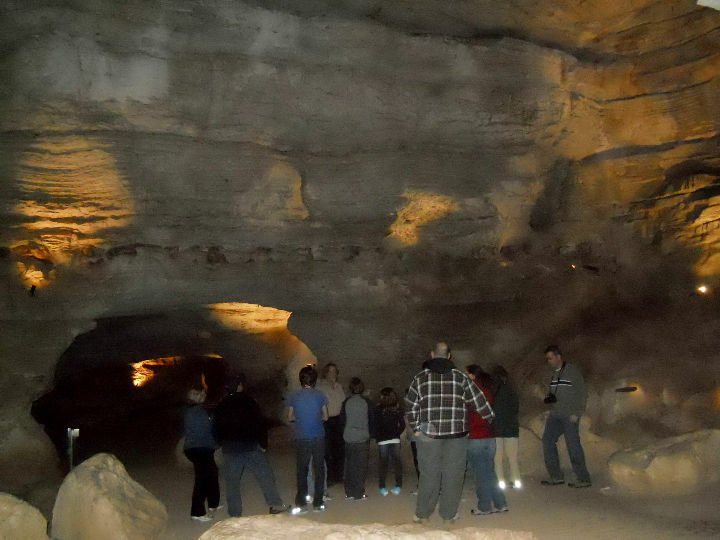 After lunch we drove about 6 miles on Park Road 4 to Longhorn Cavern State Park to take the 1 1/2 hour cave tour. We had taken the tour in the past, but it had been quite some time, so we didn't remember too much. It is a good tour and afterwards, we walked through the picture displays in the various buildings. We returned back home around 4:30 PM. During the day, it cleared up completely and warmed up into the 50s. The best day of our trip so far. 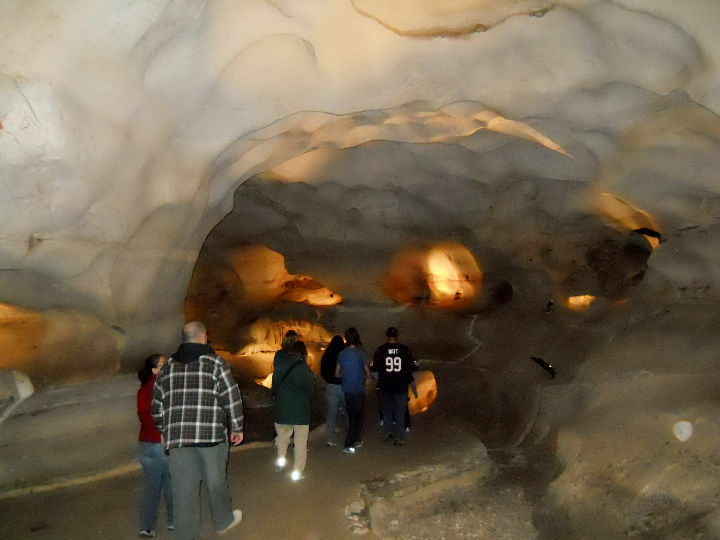 < < < Longhorn Cavern State Park. 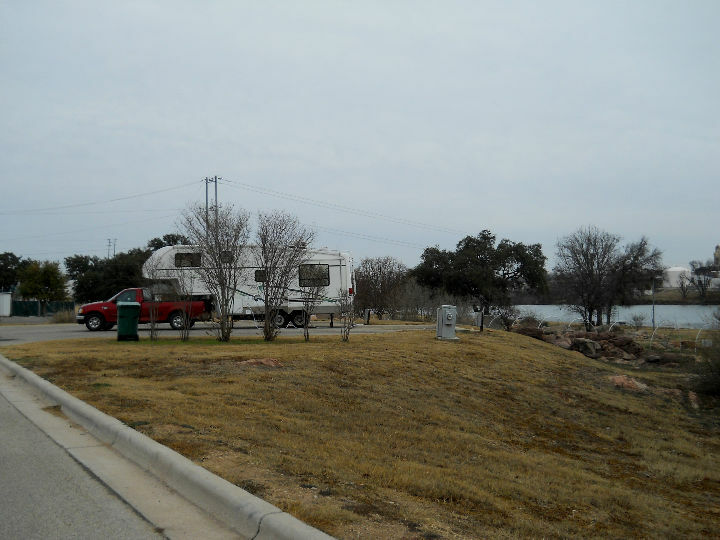 [Sunday] Today we left Inks Lake State Park and pulled the trailer via TX-29, US-281 and TX-71 to Spicewood. Our friends from Richmond, Bob & Gail, were staying at Bob's son's house to dog-sit for him. We joined them for BBQ lunch at Opie's Barbecue on TX-71. It was great! 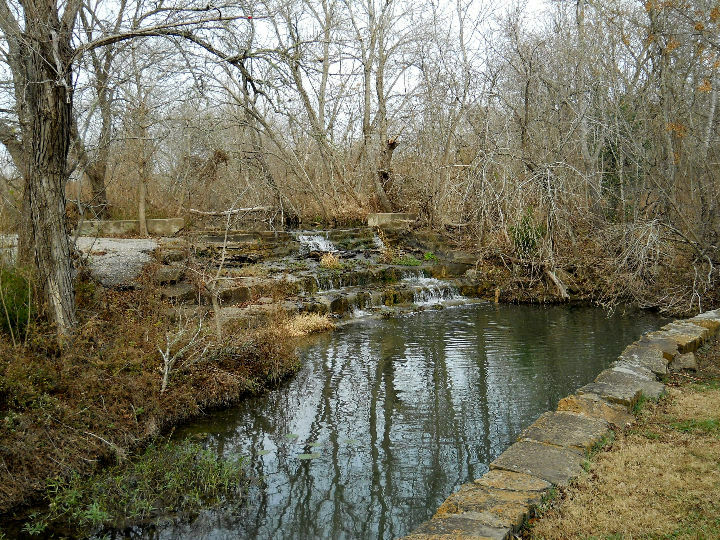 After visiting, we took TX-71, FM-3238, TX-12, TX-150 & TX-2720 to Lockhart and to Lockhart State Park. Unfortunately it was after dark when we arrived (violated one of our camping rules) and settled into site #19. < Our campsite. < The falls. [Monday] In the morning we left on our way back to Richmond via US-183 and IH-10, arriving back home in the mid-afternoon.